Disk2vhd is a free software to convert a disk into a corresponding .VHD / .VHDX image file. It can be used to make an image backup of a system, or to virtualize it on a Hyper-V environment. Virtualization is one of the key aspects of any modern and efficient IT infrastructure. Disk2vhd can therefore be a quick solution to convert physical machines (eg servers) into virtual ones, and have them immediately available in Hyper-V. Disk2vhd was initially created by the SysInternals company, later acquired by Microsoft. Go to Sysinternals page of Microsoft website and download Disj2vhd. Use VHDX: VHDX is a new disc format introduced with Windows Server 2012. Compared to the VHD, the VHDX has several improvements, including an internal organization created to reduce data corruption and increased capacity (up to 64 TB). VHDX is the recommended choice. VHD File name: Select the destination where the software will create the VHDX file (choose a different disk than the one you are making the image of, or a network path). Select the disks you want to convert to VHDX. Clearly, if you are doing this to virtualize an operating system, you will have to select the disk where Windows is installed, so that it can then start up as a virtual machine. Click on Create to start the process. After copying the VHDX file to a Hyper-V server, you can use it as a boot disk of a virtual machine. 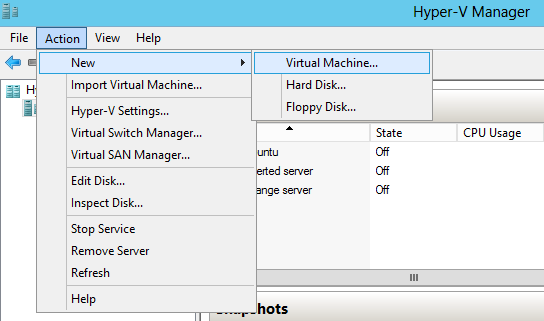 You must first create a VM using Hyper-V Manager. 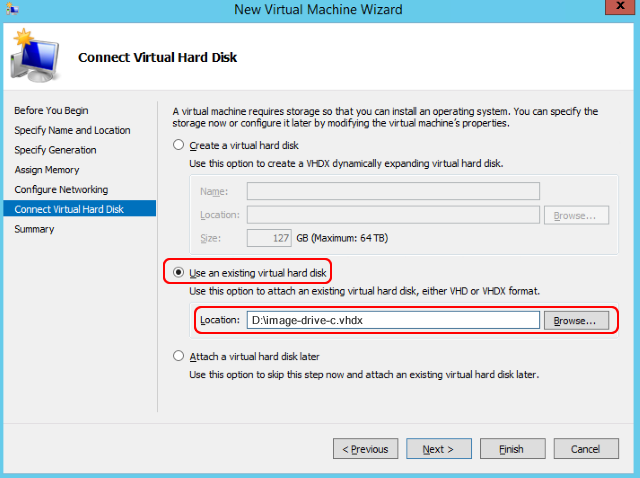 Run the wizard New – »Virtual Machine in Hyper-V Manager and configure the various parameters (CPU, memory, etc.) according to your needs. On Server 2012 R2 it will also be necessary to specify the VM generation. Complete the VM configuration and start it up by clicking on it with the right button. The first boot of the machine may take longer since the hardware configuration in the virtualization environment is different from that of the physical machine of origin. In a few simple steps you have therefore converted a physical machine into a virtual one, and you can start Windows without any further intervention. In addition to Disk2vhd, there are numerous software that allow you to clone a hard disk or perform P2V conversions. One of these is Iperius Backup, which since version 6.0 has introduced a new drive image backup mode, which allows you to clone hard drives and SSDs for both backup and virtualization purposes. Iperius also creates image files in VHD or VHDX format, therefore perfectly compatible with Hyper-V, but also allows you to restore an image backup to another physical spot, by creating a boot disk with the Iperius Recovery Environment®.